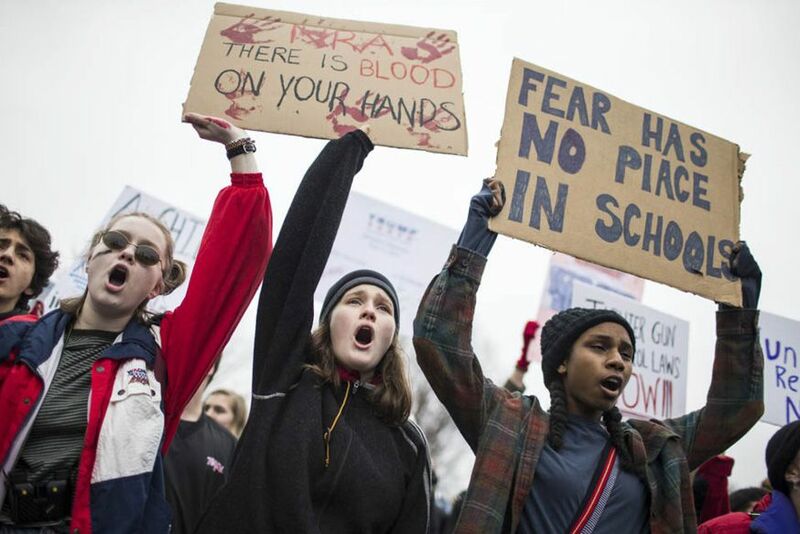 After seeing extensive television coverage of the teen activists, Trump called on Congress to strengthen background checks, and ordered the Justice Department to ban bump stocks, which essentially convert semiautomatic rifles into automatics. In a meeting with shooting survivors, he also said he favored arming teachers. Former classmates said Cruz, who was expelled from Parkland last year, was a troubled, gun-obsessed loner who posted pictures of weapons and dead animals on social media. He sank into depression after his adoptive mother died last November; his adoptive father died in 2004. The FBI apologized after admitting agents had received two tips about Cruz: the first after a YouTube user with Cruz’s name posted a comment saying, “I’m going to be a professional school shooter”; the second from “a person close to Cruz” who expressed concerns about his gun obsession and his talk of killing people. Democrats, the time for “incrementalism” is over, said Francis Wilkinson in Bloomberg.com. Rather than settling for minor tweaks that would do little to reduce gun violence, they should demand real reforms that have already worked at the state level. In Hawaii, for example, gun owners must obtain a license and register, just as drivers do; in California, every gun sale must include a background check through a licensed dealer, and family members and authorities can obtain court orders to restrict a dangerous person’s access to guns. Mental health is the real issue, said John Carlson in The Wall Street Journal. “Someone like Nikolas Cruz shouldn’t be allowed to legally buy a gun.” He was kicked out of Parkland for fighting and making threats, and attended a school for kids with emotional problems. The local sheriff’s office “received more than 20 calls” about his behavior, in addition to the two tips to the FBI. We need a national task force that would make “clear recommendations to Congress” on how and when to ban weapons ownership by deeply troubled people. What we need is a change in our culture, said Bill Scher in Politico.com. Gun-control activists think the NRA is so powerful because of its political contributions, but its real clout stems from its success in convincing millions of Americans that “terrorists and criminals lurk everywhere”—and that gun ownership is thus “central to one’s freedom and safety.” These gun owners are passionate, single-issue voters, and politicians fear them. To change the politics of guns, “the gun-control majority” will have to take a page from the anti-smoking movement, and launch a “truth” campaign that graphically shows the horrific damage guns do to so many Americans every day. What Trump ultimately decides to do about gun control is “an open question,” said Eliana Johnson and Rachael Bade in Politico.com. While aides say the president was genuinely “affected” by footage of students calling on lawmakers to act, he has “always been a base-conscious politician.” Given his strong support from Second Amendment activists, Trump is in a “unique position” to act, said Stephen Collinson in CNN.com. But those hoping for change should remember that he was also uniquely positioned to push through immigration reform—and ended up scuttling bipartisan reform to keep his core supporters happy.